Background: Awkward, extreme and repetitive postures have been associated with work related musculoskeletal discomfort and injury to the lower back. Liquid Petroleum Gas (LPG) workers in India; that is the delivery men carry heavy cylinders on their shoulders and back. The cylinders come in commercial and residential form which range in weight from 14.2kgs, 16.2kgs, 19.2kgs, 32kgs, 40 kgs etc. They have a tedious schedule of 8 h/day and mostly associated with loading and unloading of the cylinders. Their job demands a high intensity of strength and power. They are exposed to high level of physical demands and relatively lesser amount of rest which makes them vulnerable to various injuries over a period of time. 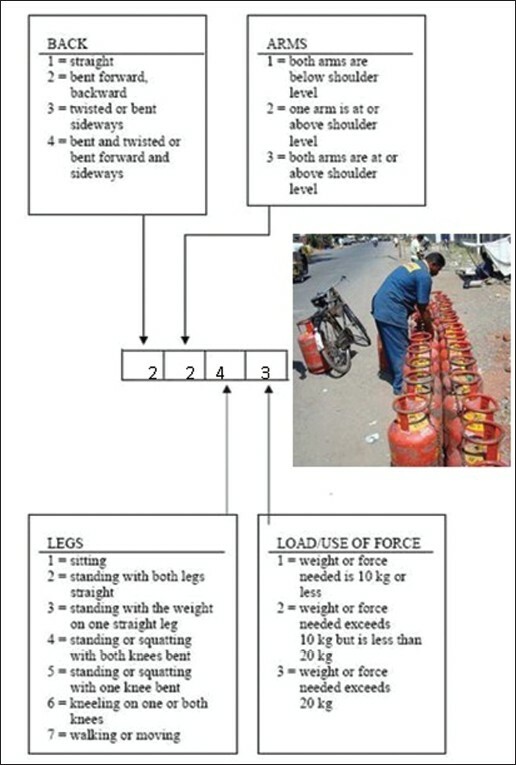 Materials and Methods: 100 LPG workers (delivery men) were interviewed using the Ovako work assessment system OWAS posture code and action category system developed by ISMAIL et al. was used. A battery of questions with specific stress was constructed and validated in the Department of Physiotherapy, Padmashree Dr D.Y Patil University, Nerul, Navi Mumbai, India. Results: This study presented an ergonomic assessment of LPG workers. The results show that the workers work in awkward postures. They transfer the cylinders in poor postures with high velocity and motion repetitiveness thus subjecting their spine to greater amounts of compressive forces. Regarding to work discomfort survey questionnaire, the postures cause ill effects on their various body segments. Among them 90% fall in category 4 while loading the cylinder, that is the load by those postures have a very harmful effect on musculoskeletal, system-corrective action for improvement required immediately. And while unloading 70% fall in category 3, which are postures that have harmful effect on musculoskeletal system. Corrective actions should be done as soon as possible. Majority of workers also complained of severe injury to back-34%, shoulder-20%, knee-20%, neck-16%, and toes-10%. Conclusion: These findings provide a prima facie evidence of higher occupational stresses among the LPG workers because of identified specific stressors prevalent in their jobs and explore the possible intervention strategies for its reduction. 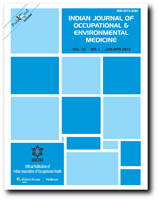 Background : The exposures of bio-aerosols have reported higher occupational health hazards, the association between serum total IgE levels and job categories and occupational health hazards of waste disposal area was limited. The present study was undertaken to assess the relationship between occupational health hazards and Serum total IgE in waste disposal area. Materials and Methods: One hundred eighty subjects working in waste disposal areas in different parts of Bangalore at Karnataka, India were enrolled into the study in 2009. Using questionnaire the respiratory morbidity and other work related problems in HWW was carried. The levels of serum total IgE in study subjects were determined by using Enzyme-linked -immunosorbent assay kits (DRG International Inc, USA). The differences of serum total IgE levels between the groups were computed by using non-parametric Mann-Whitney U test. SPSS 10.0 for windows version of statistical software was used in the analysis. Results: The levels of serum total IgE was significantly increased in landfill area (P=0.027) compose plant workers (P=0.020). The morbidity conditions such as respiratory and musculoskeletal found significantly higher in waste disposal workers as compared to controls. Conclusion: The levels of serum total IgE was significantly increased in land fill area and compose plant workers but no significant relationship was found between the levels of serum total IgE and occurrence of health related symptoms or past respiratory disease. The Monfalcone area, northeastern Italy, a small industrial district with large shipyards, shows a high incidence of asbestos-related mesothelioma. In order to reconstruct some features of the Monfalcone shipbuilding activity during World War II and its health effects, the shipyard roll were examined, and people hired in 1942 were identified. The list of 2,776 persons hired in 1942 was coupled with the Pathological Anatomy Units archives of the Monfalcone and the Trieste Hospitals. Eighteen of the above persons had been diagnosed with pleural mesothelioma in the period 1981-2005. Eight patients had their first exposure in 1942, and the others had histories of previous exposures. 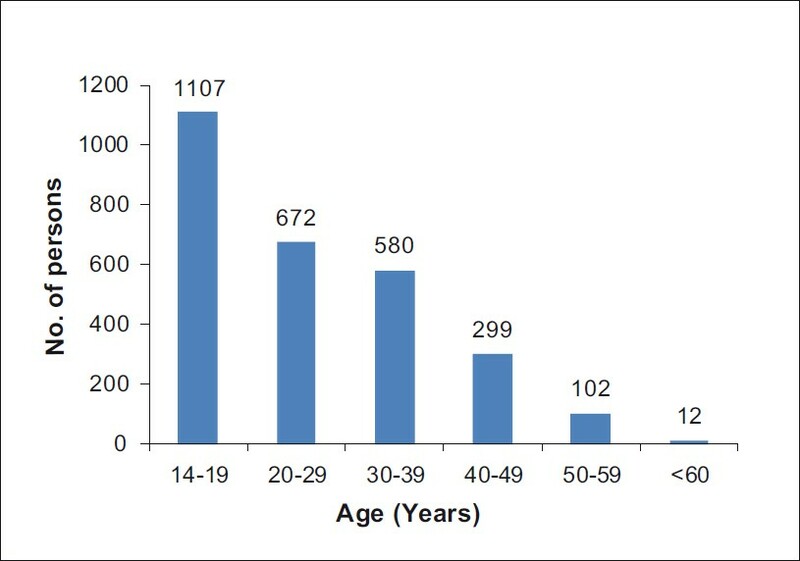 Of 557 persons aged 14-15 years in 1942, six had a diagnosis of pleural mesothelioma. 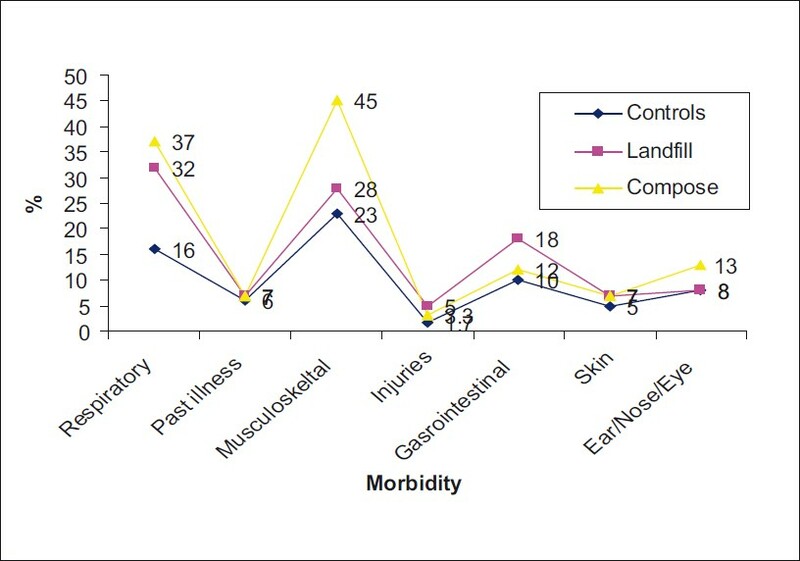 Necropsy findings were available in 14 cases. The burdens of lung asbestos bodies, isolated in 11 cases, showed wide variation (from 150 to 600,000 bodies per gram of dried tissue). While probably underestimated, the present data indicate a high incidence of mesothelioma among the shipyard workers of Monfalcone. Background: The present work aimed at to describe hearing threshold based on audiometry data of the mine workers based on their age, work station and years of working of an open cast chromite mine in Odisha, India at high fence. Materials and Methods: A cross-sectional study of hearing threshold of the subjects of the chromite mine was carried out. Audiometric data of 500 subjects were taken from the hospital of the mines of Sukinda Valley, Jajpur, Odisha, India. The latest audiometry data available during the period 2002 to 2008 was used in the statistical analysis. Results:The age group 50-60 years is found to be the most influential age group suffering significant hearing loss on both the ears. Also, the Work Zone area is found to be most significant area affecting hearing loss on both the ears. However, the subjects having experience of 30-35 and 25-30 years have the most significant hearing loss on the left and right ears, respectively. Conclusion: The hearing loss is found to be at 6 kHz, thus the working areas of the subjects working at work zone should be regularly rotated in less noisy areas to reduce the exposure duration. High frequency noise protective device should be advocated among all the subjects in general and HEMMs operators in particulars. Regular audiometry test of all the subjects should be performed to identify the hearing loss of the subjects occurring at 6 kHz. It is essential to perform periodic maintenance of all the HEMMs to keep all the vehicles in good condition those are generating noise at dominating frequency of 4 and 6 kHz. Backround: Experience of occupational stress is inevitably involved in the execution of any type of work. Stress has an adaptive value. It motivates the individual to attend to the task and get rid of the tension or demand the unattended task produced. Materials and Methods : The study was planned to investigate the differences between executives and shop floor workers on occupational stress, mental health, job satisfaction and coping. A random sample of 200 executives and shop floor employees collected from Nuclear Fuel Complex of Hyderabad City. A well developed sub-scales of Occupational Stress indicator like Mental Health, and Coping behavior were used in the present study. Results and Conclusion : The shop floor workers experiencing more job stress and lower mental health. But these two groups did not differ in their coping behaviour. The executives are better with work home balance. Background: The process of jewellery making involves the goldsmiths working with tiny visual tasks at closer working distances, which demands high visual ability. Aim: To establish vision standards for Goldsmiths. Materials and Methods: Visual task analysis was carried out in different Goldsmith workstations. 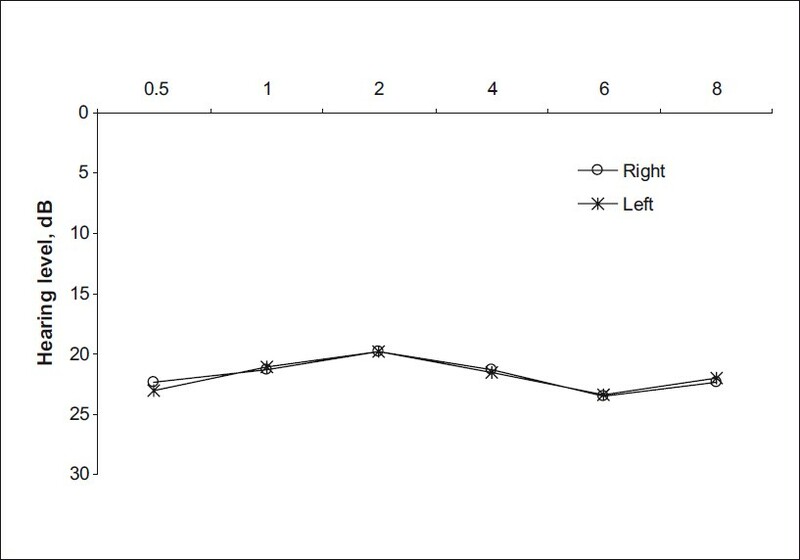 The minimal visual demands of the jobs were determined based on Grundy's nomogram. Depending on the importance of certain visual functions to perform the job, criteria for visual competency was laid down. 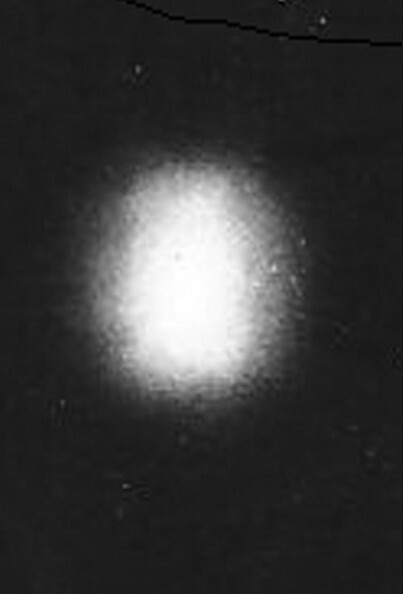 Visual abilities of goldsmiths were evaluated in order to determine their visual capability status, based on the previously laid criteria. Job competency status of goldsmiths was determined based on the supervisors' grading with respect to the quality and quantity of work. Visual competency and job competency of goldsmiths were then compared in order to establish vision standards. 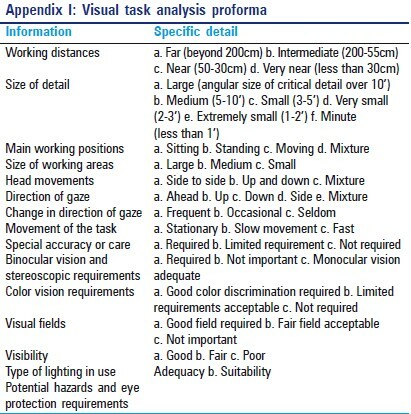 Results: Visual task analysis was carried out in 91 workstations. The median of working distance, work area, critical size of the task, and illuminance were 23 cm (IQR: 20- 29), 514.5 Sq Cm (IQR: 183-746.5), and 536.5 lux (IQR: 170-536.5), respectively. Visual abilities of 113 goldsmiths were evaluated. 44.7% of goldsmiths were found to be visually competent. Job competency status of 30 goldsmiths was obtained, in which 18 (60%) were found to be highly job competent. Based on the visual demands, vision standard for jewellery makers was developed. Conclusion: The vision standards so obtained could be used as minimum visual requirements for the entry level Goldsmiths.